Homemade lasagna tastes so much better than store bought. You can make one of these ahead of time and heat when you are ready to eat. This recipe is by Lee Ann Russell. Springfield, Mo. Lasagna makes a great meal. Preheat oven to 350 degrees. Brown meat in skillet with onion, and garlic, cooking slowly. Add tomatoes, sauce, seasonings, sugar, and simmer uncovered for 30 minutes. In separate bowl best egg, and blend in cottage cheese. 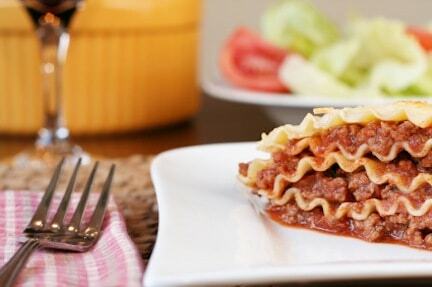 In a greased 2 quart casserole layer 1/2 of the meat sauce, 3 noodles, 1/2 cottage cheese, 1/2 mozzarella cheese. Repeat layers and sprinkle with Parmesan cheese. Bake for 30 to 40 minutes. 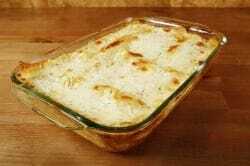 Please, take off the “Italian” tag of any lasagna recipe containing cottage cheese! After making home homemade fresh cheeses I was going to reply that the ricotta cheese and cottage cheese were similar, but they aren’t. Difference between Ricotta and Cottage Cheese. Growing up I don’t think ricotta was sold in my local grocery store, so for me, we always used cottage cheese. I am going to guess it maybe like that for some people still. I understand that maybe no true Italian would ever use cottage cheese in this recipe. I am not going to change the designation of this post. I appreciate your passion for Italian style recipes!